Wow what an eventful year 2016 was at Home of Peace. A year of many miracles. 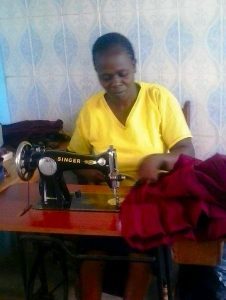 * We employed our own seamstress who is saving us money by making all the children’s clothes, school uniforms and staff uniforms. * All our staff and children are now covered under the National Health Insurance Plan. * Our staff are now registered under the National State Pension Scheme. * Following a major storm we had to undertake a major building project. This resulted in 2 new boy’s dormitories, 2 staff bedrooms, a laundry, additional toilets and washing facilities and the conversion of our temporary dining room into a permanent structure. * We also installed a second water storage tank. Financially it was a really difficult year with major expenses, the fall in the value of the British Pound and rising costs. We thank God for all those who responded to our appeal and helped meet these needs. 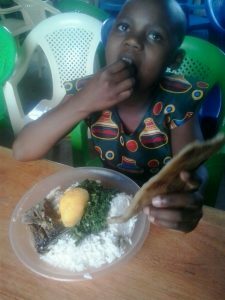 Local children were invited to join our children for the Christmas meal. 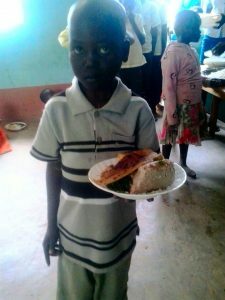 These were children who would otherwise not have had a special meal at Christmas. Thank you.